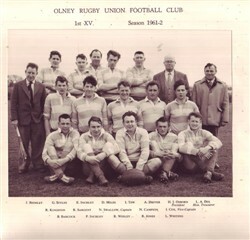 Olney RFC 1st XV, black and white team line-up photograph season 1961-62. Back row: J. Brimley, G. Styles, E. Inchley, D. Miles, I. Tew, A. Driver, H.J. Osborn (President), L.A. Dix (Honorary Treasurer). Middle row: R. Kingston, R. Sargent, N. Swallow (Captain), N. Campion, I. Cox (Vice-Captain). Front row: B. Barcock, P. Inchley, R. Wesley, R. Jones, L. Whiting.